extinction | A Barbet is a Barbet is a Barbet..
A Barbet is a Barbet? NO! It’s quite obvious..and worrisome for those who cannot relate to history and facts. ( click on picture for full size). At least the genes aren’t lost, but for how long? How many people defend the old breed other than me? Esturgeonne issued from crossing Poodles and dogs of unknown origin which set the “type” for the MODERN breed in 1989. There are lots around today! The pedigree is this dog is probably creative, but the proper type is there.1983.The type of a GRIFFON. After repeating over and over … …and over that I needed to do totals on Ermengarda’s /Coccolina’s name in pedigrees around the Barbet world..I finally sat down and did it. Extremely time consuming because done with a paper and pencil….BUT , the exercise does give you time to understand many ” things” in our organized Barbet world. As a simple example for a start..
Colleen in Sweden. Colleen had litters with Luddelumps and Quaciendas. Then she had issues, never resolved with the club who set her aside. Luddelumps was the first breeder to have Barbets in Sweden. They were also cast side for xyz reasons. Brush away 1.
Cooper. A litter of 6 because the type and background history at the time was not appropriate. Breeders turned to breeders for studs. Caspar, progeny gave 4 pups in 2016. When you compare with other studs and usage, you draw your own conclusions. Comparing who did and said what and their influence on decisions is enlightening when keeping in mind the cyno-political situation of the time. Chi chi l’Amoroso. In Finland, they are under a state of PEVISA which means each stud can only sire litters which total 15 pups. That is exactly what he did. The cyno-political situation there is more about crossbreedings to fabricate hunting dogs than carrying on a line or a breed. The examples from the past few years confirm that. Caya in France. Caya had 10 pups with Bepop which was nice at the time ( a Barbet I kept under my roof for 10 months to help get the breed started in the UK/ you’re welcome). He is in the pedigree of 132 dogs. Many breeders making the trip to the UK for the color in his line. His son Dudley who was not ever supposed to breed, placed and taken back produced 42 pups. Many in Dutch pedigrees produced the type of the line. Many also came from as far as Switzerland to mate with Netis Hazzah his son, who has produced 48 pups to this date. Caya’s total branch so far is 132. Most of the people who went to the UK did so also because it was best not to talk to me anymore since I had already voiced my opinion on what was happening, in our organized Barbet world. Climax was in 2010/2011/2012 just before SYMPOSIUM catastrophe when the research I had been conducting mostly on my own led me straight to Poodle references and crosschecked facts. No good for the breed or its governing authorities. The Poodle already existed. There had to be another track…Since 2003, I had spent a lot of time, but the conclusions were there. This is when it tipped into nastiness, bad mouthing and warnings of different sorts by the voices of knowledge around the world. 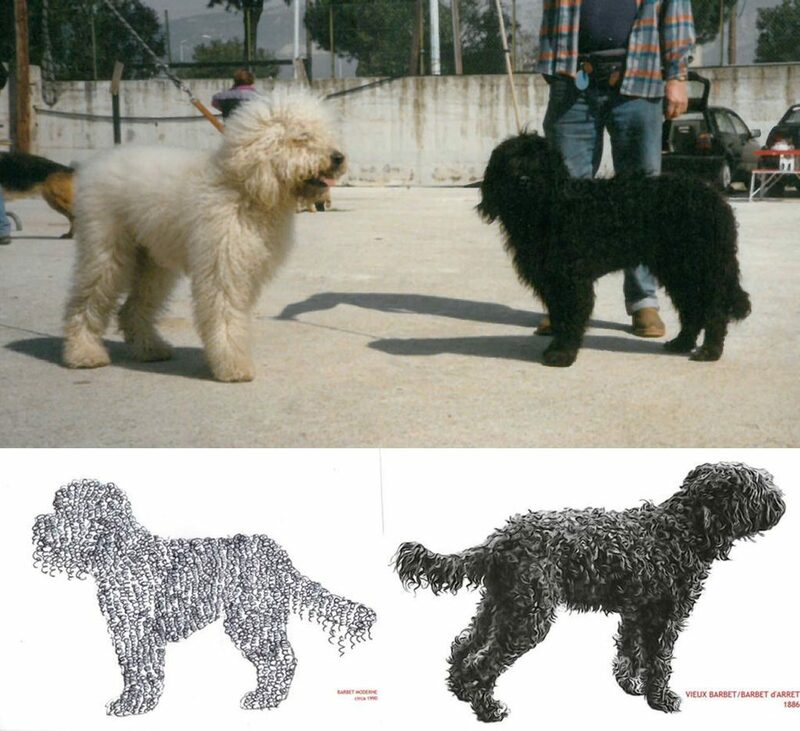 People had been happy with the “Poodle” bit and it made everything much easier that working on a breed threatened with extinction. I had voiced my concernS with what was going on and disapproved of it, publicly as I do today and will continue to do so. That was the kiss of death for Elaine. So facts in front of their blind eyes that they chose to ignore in order to continue down their own path laid out by internet stories and copy and pasted hi- (socute) stories. A very lucrative business could come to an end if too many listened to me..
Now the case of Charly..I was very lucky to keep in touch with his owner and family who could think on their feet and assess the goodwill of the different protagonists who came through their domicile and studding was not really in their wishes or objectives. Charly is in 86 pedigrees as some were “refused” a mating. Not into cyno-politics. Chesara. 1 litter but…her progeny Ela Samba did the rest..85 times she appears in pedigrees. No cyno-politics on this side of the French border, but her situation was much different in her country of residence due to cyno-politicking and the likes making her life difficult. Compay II. Due to collaboration, interactive help and support..with some, he has reached a stunning figure of close to 400 since all of his litters are not up to date in database. At some point in time, I did think it was a lot..but what is a lot with others re-using studs which are far from breed standard. After all..
From looking at the names of the breeders and who did what, historically it is interesting to follow a thread. This is where it can be compared to the past and who did what when, too. I have that information. More the reason to shut me up. That is what got me thinking about what went on in the 1980’s. On a much smaller scale, but many parallels. Badmouthing, alternative facts..and paving the way to? Back then, it was very easy to substitute dogs in matings/pedigrees..The first one being Lynx/Ops mating which probably never took place since our famous color genetics specialist would say it was not possible for always having so much to say about everything..along with some facts about him not being interested in reproduction. BUT of course anything is possible with a mutation or whatever supports the other truth about the breed. Then, we most often talk about Mrs Pêtre but never about the other 2 breeders around Paris who must have helped each other especially in the mid-80’s when there were 2 clubs fighting for SCC statute. Ring a bell? Well a sentence keeps coming back to my mind said by the late Françoise Loiseau..when she saw them arm in arm in 2005..at a club show. Tiens, tiens.. Looking at who owned who and who went to shows and did this and that is of great help trying to wade through the types produced which would connect some of the dots to the 70’s and… before. That alone would be out of question for someone wanting to re-create a breed from scratch along with the fame connected to it. In the early 80’s lots went on that has influenced /have an impact on the present, but we do not know that it if we just look at pedigrees. The cyno-political context is of utmost importance. That has not changed. What has not changed either is the desire of both sides to continue in their path. One for truth and the other for fear of truth and what derives from it. Derive is a very good word in this case for its multiple meanings: to obtain a substance from another/to “get” something from something else. That is basically what has happened to the breed: it has been derived and to such an extent that coming back to the source will be or is literally impossible. 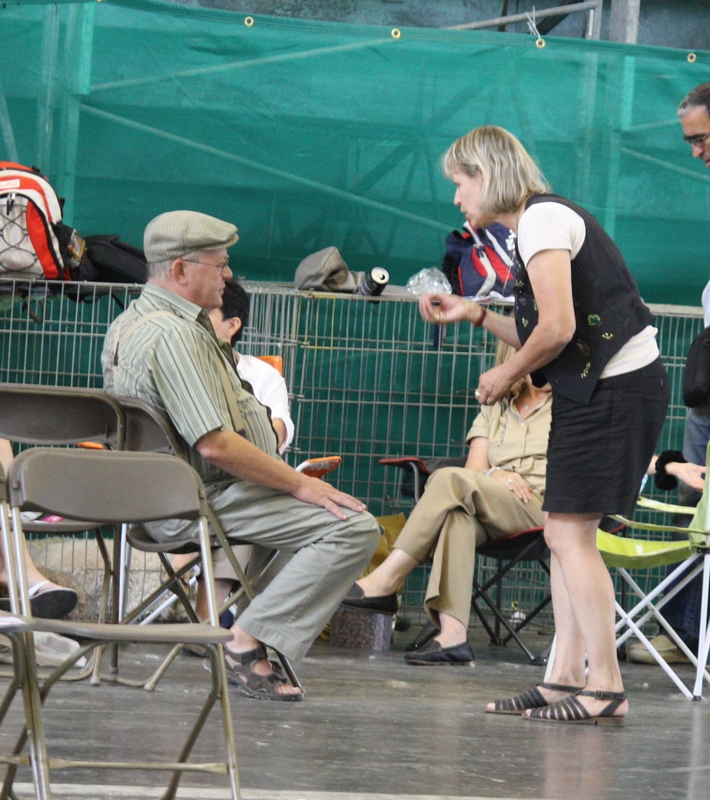 The breed is seen as degenerating here and there in photographs and forums, another interesting word : Public medium (such as a newspaper column) or place used for debates in which anyone can participate. In Roman times it meant a public place at the center of a market or town where open discussions on judicial, political, and other issues were held. In FB times, it means only those who know very little or nothing and are not a threat, can post. Others are invited to stay away. That is our Barbet organized world today…but take some time to digest your facts, if that is what they are and on that happy note..enough said for today.. back to more research! 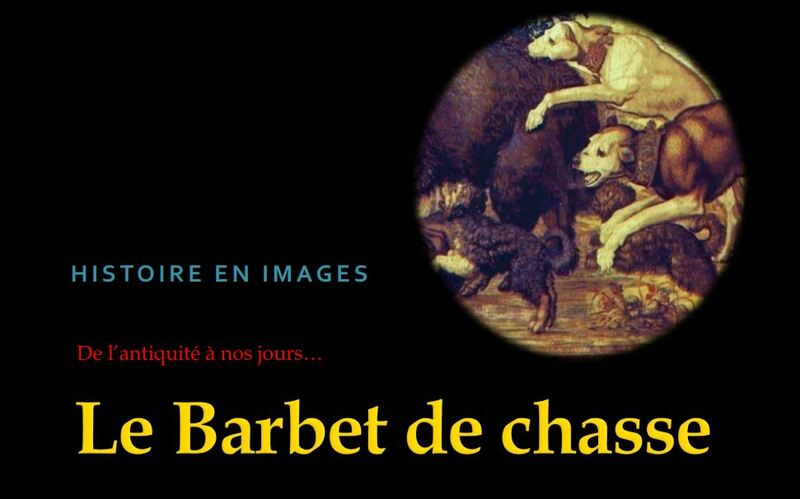 On the left, poofed out like a Bobtail, Jerry Sable des Malabris de Basse Sologne a very typical Re-incarnated Barbet Moderne( poodle type) and on the right, the Vieux Barbet portayed by Hercule di Barbochos Reiau de Prouvenco which is severely threatened with extinction.The Barbet is a rustic breed that should require only very little grooming. Photo taken in 1996. The Barbet Moderne is very popular in several countries where they have managed to continue the line very well. It is not in need of survival..it’s a new breed, similar to the Labradoodle. There are a lot of fake truths circulating about the breed, which are terribly misleading. 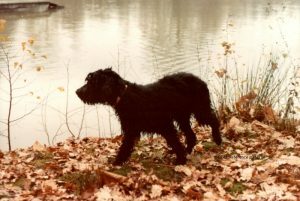 The link below will give you access to the history of the breed “en images” so everyone can understand! There are a few mistakes to be corrected, but the overall idea is there. Getting to the core of the Barbet matter. IF it were, it would look like one and it does not. 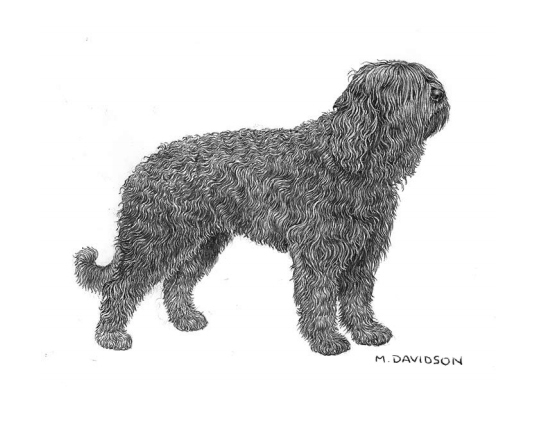 The drawing below was made in the late 1990’s by 2 Australian sisters, commissioned by the Nordic Kennel Club. This is what best portrays the Vieux Barbet, Old Barbet or Old Bloodlines. Nothing to do with the looks of a Poodle. Several have laughed and tried to ridicule what work/ research I have done, or simply tried to ignore it, but however keeping an eye on my every move. It does become frustrating to be under a magnifying glass on a permanent basis, but that is life. It does, as recently read on a social network page, get rather annoying. I have found help along the way and more help and finally we have gotten to a point where something can be said publicly. The person above dragged with him Belgian and Luxemburger nationals, along with some Canadians and Swissers, others being lessers in “contributing” such as french nationals and the likes. I tried to understand what this is all about and read the article of Lanckmans; must say he should have asked one of his colleagues to help him with a proper English translation, because it seems to be some online translator’s product. At the end but it doesn’t make so much difference. It seems he got his certificate for history teacher, which technically does not make a man a historian, but a school teacher whose task it is to bring some basic awareness of history to school children. I’m sorry to be a bit fixed on the person, but the picture of his certificate seems to meant to deliver the evidence that we should stop using our brains. Analyzing I must say it’s interesting how he points out where the idea comes from about the North African origin: one had such assumption 400 years ago or so and after that people loyal copied it, but no one ever checked it. Further he makes a fixation of the facts several phases of the registered breeding started with dogs of unknown descent or from locally known lines, which weren’t registered with the LOF. He seems to try to let the reader believe a dog breed does not exist when it has no papers …. this is the thinking level of an office clerk, and not of an historian. If he had any sense for history he would have obtained a solid level of background information what starts with the French hunting dogs and the French registration system and how it worked over the years. I have some original pedigrees of Petit bleu de Gascoigne from the early 1960ties, when there were only 2 registered with the LOF. Most was bred without papers, but people knew rather well their origin and lines. The system was, inf I remember well, more or less any good looking specimen of the breed could become registered but got provisional papers and had to be confirmed at the age of about 1, to be sure the dog really turned in to the breed he should be. It should be to expect that after lets say 4 or 5 generations of registered dogs, the confirmation wasn’t necessary any longer, but I don’t know exactly how that went. This made is also possible to use a crossbred with a related breed (in case of the Bleu de Gascoigne, some had blood of the Gascon-Saintongeois, or Anglo-Gascon). At the confirmation it was definitely decided what breed it was: Bleu de Gascogne or Gascon-Saintongeois. A very simple system, but effective and helpful for the situation. Lanckmans seems to think that when a dog has no papers it does not exist, and when after some period people start to breed it and have it registered, that their dogs, in exterior and character (working capacities) may just have fallen from the sky. Evidence for the purity of breedtype you obtain by observing the results of breeding. If there is some degree of permanency, fitting in a certain frame, what more evidence does one need to understand dog of those special characteristics must have descended from other dogs with the same characteristics. So dogs from after the war somehow descent from the dog before the war, and those from before the war descent from those in the later 19th century and those in the later 19th century from those early in th 19th century, &c.
Those who need to know the name of the author, know. This is info from the SCC, I( meaning ME) finally got it today. “Nous ne pouvons malheureusement pas vous donner plus d’indications sur les parents de Bézeff de Floirac ( in the database that everyone runs to that is pseudo official). En effet, le registre du LOF n’indique que leur nom : Médor et Timballe. N’ayant pas eu accès aux documents primaires, nous avons préféré écrire les races entre crochets. So, the SCC says “we think” and the next one says we think is a fact and it snowballs into what we have today. I am the one who got the info about Medor and Timballe from the family/descendants of that particular breeder when they let me use their archives. So, what I say is “croire ( infinitive)= cru”( past)= believed, but then on the other hand…Then you say cross check everything you say which I believe (croire) is certainly wise. So I published what you said without referring to anything or anyone. The ones who come here know who wrote it, of course, but no one batted an eyelash on it, whilst continuing to claim the drawing ( stupid, I agree, but official SCC/FCI and only breed club can modify it which does not seem like a complicated task. 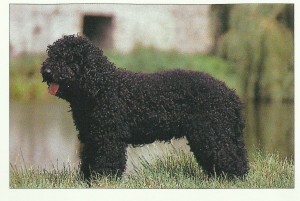 What is a Barbet dog?